Philippine Republic Day. 118th anniversary celebration at Malolos City, Bulacan and Barasoain Lodge No 12 in coordination with the National Historical Commission and the city of Malolos. January 23: participation in commemoration rites at Malolos City. 53rd death anniversary of General Emilio Aguinaldo, first president of the Philippine Republic, February 6; commemoration rites at Aguinaldo Shrine and President Emilio Aguinaldo Memorial Lodge No 5, Kawit, Cavite. Commemoration of the 148th birth anniversary of General Emilio Aguinaldo; March 22, at the Aguinaldo Shrine and President Emilio Aguinaldo Memorial Lodge No 5, Kawit , Cavite. Family picnic and activities in Tanza, Cavite organized by La Naval Lodge No 7 and District One. Dates to be announced. Masonic District One Eleventh Annual District Convention. May 20, Cavite Lodge Masonic Center. 119th anniversary of the declaration of Philippine Independence. 153rd birth anniversary of Apolinario Mabini. July 23; commemoration rites at Mabini Shrine, Tanauan, Batangas. August 30; commemoration activities at Marcelo H. del Pilar Shrine, Cupang, San Nicolas, Bulacan and Barasoain Lodge No 12, Malolos, Bulacan. 11th Anniversary of the Grand Lodge. 13 Martyrs of Cavite Day. 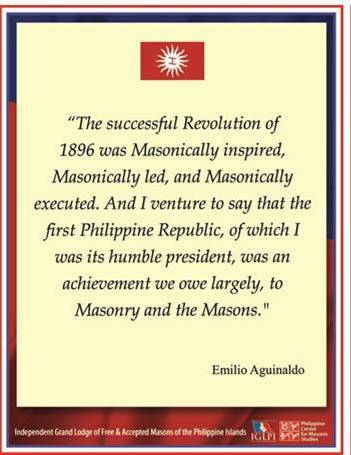 September 12, Bagong Buhay Lodge No 4 Masonic Center in Cavite City. Lodge of Sorrows. Memorial to all deceased brethren. ​Dr Jose Rizal. December 30, Rizal Monument, Samonte Park, Cavite City and Bagong Buhay Lodge No 4. 161st birth anniversary of Graciano Lopez Jaena.